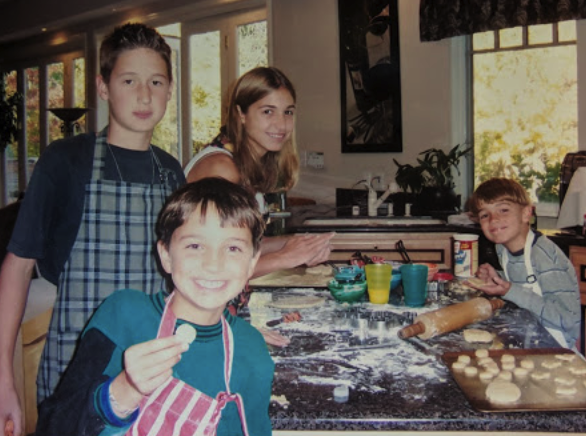 I tried to instill my four kids — Hayden, Tate, Kayla, and Dexter (left to right above) — with good values, including how to invest while they are young and how to bake a mean sugar cookie. Even some adults might be surprised to discover what a difference it makes if you start investing at 30 years old versus 50 years old, so that, by the time you hit 70, you won’t have to work if you don’t want to! While 70 seems a long way off for someone who’s 15, 25, or even 35, flash some of these numbers by your kids and they’ll soon get the picture: At 10% interest, $1 invested at age 30 would grow to $45.26 by the time you’re 70; if you invested your $1 when you were 50, it would grow to only $6.73; but, $1 invested at the age of 10 will have grown to an incredible $304.48. Wow! This is why I taught my four kids about investing money at an early age. I really wanted them to see and understand the growth potential. When you first invest, it seems painfully slow. To get my kids excited about it, we would look at a compound chart together so they could see how it works. For the past nine years, I’ve been able to use our first fund, ROI Strategies, as a fun (and true-to-life!) investment exercise. Now, they couldn’t invest their money for real, so we just put the numbers on a spreadsheet, but they would actually save money by giving it to me, and I would in turn track it as if they were earning their 10% average annualized return in ROI Strategies. They were thrilled to see how much their “investment” grew every month while they were sleeping. I struck a deal with my kids early on. I had them sign a contract stating that, if they agreed to save a certain amount per month, which increased as they got older, I would seed each of their accounts with $1,000 plus whatever they had saved at the time. It worked very well to help my kids not only see the value in investing and saving, but also to build the habit of saving money every month. I believe financial literacy is a sorely-missing component in our education system. It’s so important that a young person understand how money works before setting out into the world! That’s why, years ago, I joined the board of Junior Achievement, a non-profit financial literacy organization. In addition to supporting Junior Achievement, we are sponsoring a class through The Hayek Group, a Nevada-based organization named after Austrian economist Friedrich Hayek. The Hayek Group raises money to implement the Dave Ramsey’s Foundations in Personal Finance curriculum in Washoe County high schools, teaching teenagers how to make sound financial choices. It’s strange and scary that this knowledge from elders is often neither passed down to youth nor taught formally in school. If you feel the same, I highly encourage you to support either of these organizations through a monthly donation, and of course, to start passing the torch of knowledge to all the future adults in your life. Here’s one more fun rule I used with my kids when they were growing up: the Two Week Rule. If they wanted to buy something, they had to let us know and then wait two weeks. That saved lots of money because, most of the time, that impulse purchase was forgotten two weeks later. If not, it meant that they really wanted it, and it was a meaningful purchase for them. I mentioned earlier that we’ve devised a way to help give your children and grandchildren a real life investing experience. It’s simple: A child gives his or her money to a parent or grandparent, who then puts that money into their account in the fund. We’ve done this for a few investors now, and it has been a hit for the whole family! The child receives a separate statement so that they can track and watch their money grow, but more importantly, it gets them excited about their new-found investing habit that will hopefully last a lifetime.